When we first meet Harriet Lee and her daughter Perdita, they seem fairly normal. Perdita is a London teenager who attends an upperclass school while her mother awkwardly tries to fit in with the other mothers on the parents’ advisory committee by bringing them tins of her famous gingerbread. But those mothers do not properly appreciate the gingerbread gifts, perhaps because they are unaware of the existence of the country that Harriet Lee and her gingerbread came from. It’s called Druhástrana. It’s not on our maps and it’s not easy to get in or out of. But Harriet knows how and when her daughter Perdita tries to visit her mother’s homeland, she nearly dies. As she recovers, Harriet finally takes the time to tell Perdita all about her strange childhood in Druhástrana and how she eventually arrived in London. 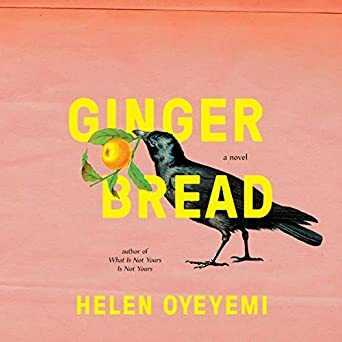 There are a few things I absolutely adored about Helen Oyeyemi’s Gingerbread (2019). First is that she narrated Penguin Audio’s edition herself and it is fabulous. She is a wonderful performer (in my experience, most authors are not) and it was great to hear her interpretation of her own novel. I’m so glad I read the audio edition of Gingerbread and I hope that Oyeyemi will continue to narrate her own (or even others’) works in the future. Second is the sheer inventiveness of this whimsical work. I admire Helen Oyeyemi’s prodigious imagination — all of the fanciful and amusing ideas strewn throughout the novel as well as the way she wove the gingerbread / fairytale allusions throughout. Third is Oyeyemi’s beautiful prose — each sentence is a delight to read and the story is imbued with sharp insights and a delightful, often sardonic, wit. Despite these things, I can’t say that I loved Gingerbread and that’s because I just didn’t think it was an entertaining story. The idea of a hidden country that is hard to get in and out of (the gingerbread is involved in this) has so much potential, but Harriet’s description of her life there, the people she knew, and some of the bizarre things that happened to her, just wasn’t very interesting. The elements of her story felt random, often confusing, and — I hate to say this — kind of pointless. As I was listening to Gingerbread, I felt like I was having two separate experiences, one in which I was loving Oyeyemi’s imagination and prose and the other in which I was asking myself “what’s the point of this story?” Almost certainly a second reading of Gingerbread would illuminate more of the author’s purpose, but I didn’t like it well enough to read it twice. Readers who love magical realism, don’t mind feeling disoriented and confused, and enjoy trying to make out the author’s intention, will appreciate Gingerbread more than I did. However, while I did not love this story, I did love Helen Oyeyemi and will put the rest of her work on my TBR pile. Published in 2019. The prize-winning, bestselling author of Boy, Snow, Bird and What Is Not Yours Is Not Yours returns with a bewitching and inventive novel. Influenced by the mysterious place gingerbread holds in classic children’s stories–equal parts wholesome and uncanny, from the tantalizing witch’s house in “Hansel and Gretel” to the man-shaped confection who one day decides to run as fast as he can–beloved novelist Helen Oyeyemi invites readers into a delightful tale of a surprising family legacy, in which the inheritance is a recipe. Perdita Lee may appear to be your average British schoolgirl; Harriet Lee may seem just a working mother trying to penetrate the school social hierarchy; but there are signs that they might not be as normal as they think they are. For one thing, they share a gold-painted, seventh-floor walk-up apartment with some surprisingly verbal vegetation. And then there’s the gingerbread they make. Londoners may find themselves able to take or leave it, but it’s very popular in Druhástrana, the far-away (and, according to Wikipedia, non-existent) land of Harriet Lee’s early youth. In fact, the world’s truest lover of the Lee family gingerbread is Harriet’s charismatic childhood friend, Gretel Kercheval–a figure who seems to have had a hand in everything (good or bad) that has happened to Harriet since they met. Decades later, when teenaged Perdita sets out to find her mother’s long-lost friend, it prompts a new telling of Harriet’s story. As the book follows the Lees through encounters with jealousy, ambition, family grudges, work, wealth, and real estate, gingerbread seems to be the one thing that reliably holds a constant value. Endlessly surprising and satisfying, written with Helen Oyeyemi’s inimitable style and imagination, it is a true feast for the reader. I think I’m in the category of people who would love this and so I’m going to order it today. It sounds like it could be a companion to SOURDOUGH, but maybe that’s just because of the element of baked goods. I can’t wait to read another story by Oyeyemi. She’s fabulous. Even though I didn’t love it, I’m glad I’ve encouraged readers to give it a try. This is one of those books that I greatly admired while not being particularly entertained by the story. Jana and Marion, I hope the two of you will love and review it.